Trying to get your house organized? I am always looking for creative ways to clean up, declutter and organize especially now that we've moved into a new home. First of all, I have OCD (obsessive compulsive disorder) and am very particular about everything having a place and function. I label everything and come from a woman (my mother) who uses post-it notes like they are a daily survival necessity. So, when I heard I would have the opportunity to review the Magic Mil Chalkboard Labels and Chalk Pen, I was thrilled! Each pack comes with a Chalk Pen and a variety of size labels - 12 Large 3.5" x 2" Stickers, 18 Medium 2.5" x 1.5" Stickers, 18 Small 1.8" x 1" Stickers. Each label has a strong self adhesive backing which is both freezer and dishwasher safe. 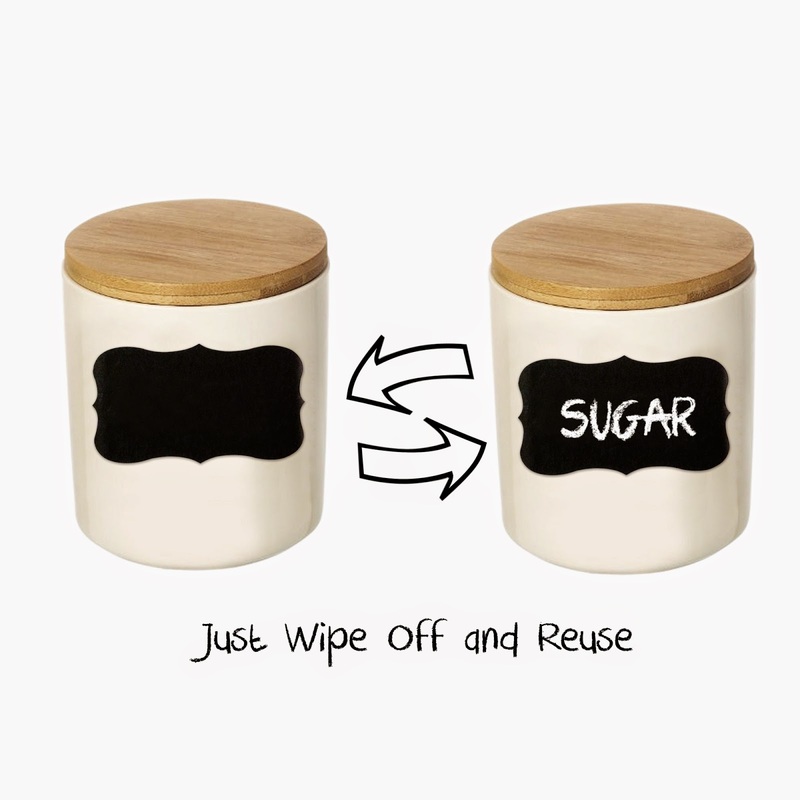 The matte finish makes for a stylish way to label any jar, bottle, or any other surface. I love that even though the chalk pen can be wiped clean with a damp towel, the labels themselves have a "Stick For Life" guarantee. This means even if you label something today and change your mind tomorrow (which I frequently do), you won't have wasted a label or deal with a peeling label after erasing the written text. I am always changing things up and reorganizing so I am forced to either not label or change and change again every time. With these labels now all you have to do is wipe clean, write the new correct text, and your done! Recommendation: I recommend these for anyone, any age, and any purpose! These are reasonably priced even if you have to buy a ton say as wedding favors or a large project! 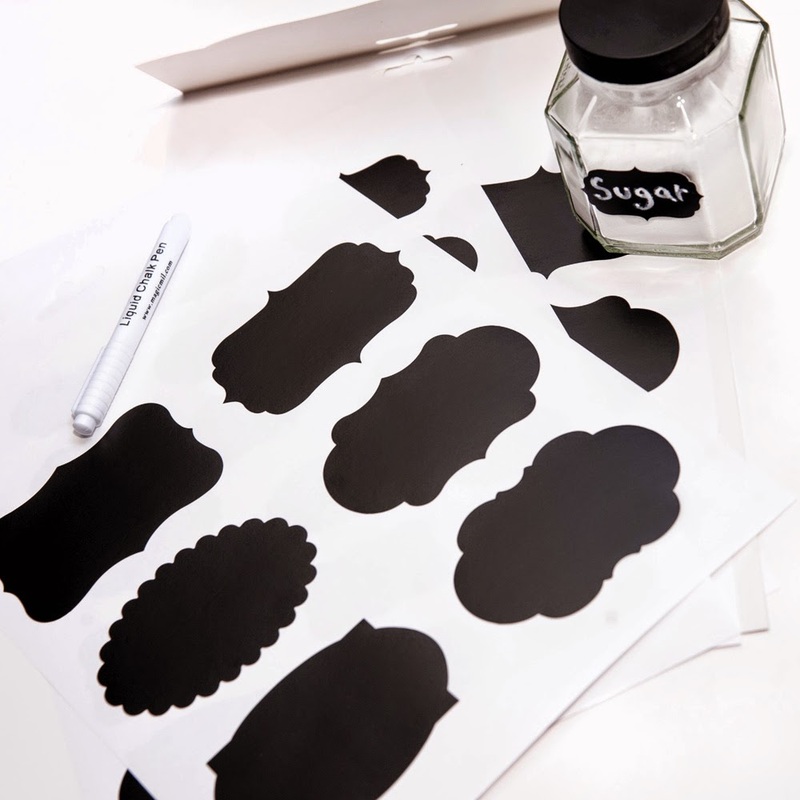 Giveaway: Magic Mil is going to give THREE of A Lucky Ladybug's lucky readers a set of Chalkboard Labels to try of their own! I would like to use these in the kitchen. Labeling would be so easy and fun. We could use these for our daughters school projects, as well as to keep track of everyone & their schedule! ! I would use in my kitchen for sure. I'd love these in for my craft drawers. Chalk labels are just so cute! I need some of these for pantry labeling. Thanks for the chance! These would be so cute on a smaller child's dresser labeling what's in each drawer, socks, underwear, etc. I would use them for my craft supplies to label what is in the drawers of my craft containers. I will absolutely use them in the kitchen! Spices, baking supplies, and even snack jars! I could really use these in my pantry. I have been trying to label and organize our snack items and these would be great to make everything easy to find! Would be good for our storage bins. I would use them to label in the kitchen. I love organization. I would use them to organize my kitchen pantry. I could actually use these the most at school to organize all of the varied supplies I have for my students. I would like to replace all of the plastic containers I am using right now with the extra large mason jars, but have been trying to figure out how I want to label them. Up till now I was considering etching. I think this would be a much better way to go. I would be able to change up between jar sizes easier as well since I would be able to change names easily. I don't even know where to start - I'd use them for my spice jars, several ceramic containers in the fridge (so hubs would finally know what's inside), and for the pantry shelves. I would like to re-organize our pantry. 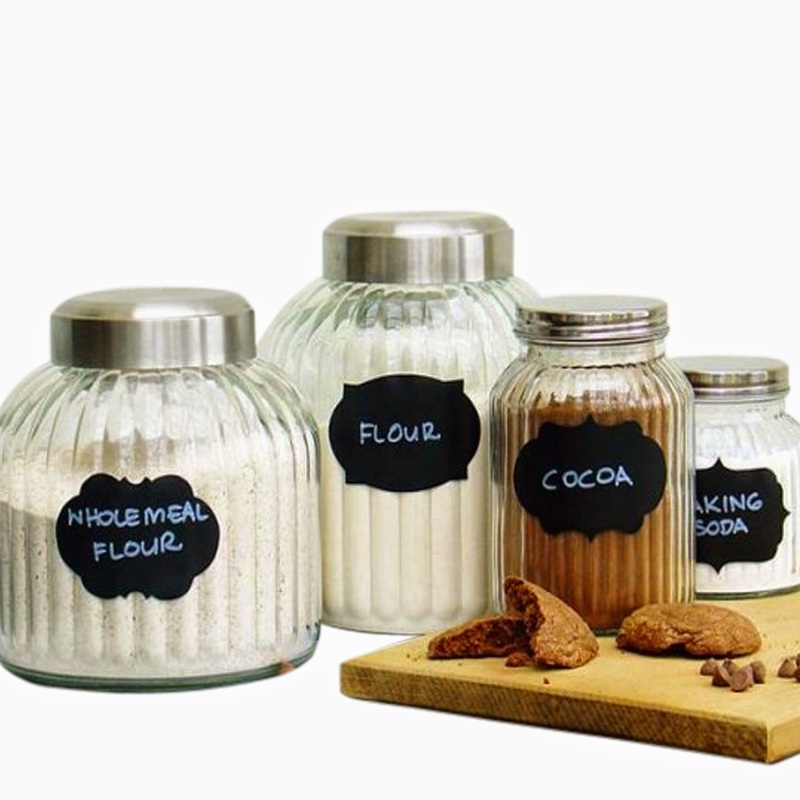 These labels would be great for canisters and jars for beans, flour, sugar, pasta, etc. This would be used in my home office on the drawers so i know the contents. This is the theme for my sisters wedding and she would love them! Label my son's dresser from the outside! He's in Kindergarten so this would b great to help him read. Also I'd label our arts and crafts and toy boxes! I would use them on my canning shelves! Go-ahead guys you are really accomplishing a great job. Best of luck!